The software is very easy to use & for first time user it is fairly simple to get started quickly. Pros: 1) Simple to create screens & adding interactions from one screen to other is very easy. 2) Enough UI Elements library to create wireframes & clickable prototypes. Cons: 1) Horizontal tab navigation for screens: As the application has horizontal tab navigation for screens, it is very difficult to see all the screen as there is limited space, also adding more screen increases the scroll which slows the working speed by increasing the time to find the screen to work upon. Also, the application always crashes when there are many screens added to to horizontal tab. I would suggest to have vertical left navigation for screens, as available in other prototyping tools such as Axure. 2) Old set of tablet & phone devices for screens: because old iPhone & tablet shells the prototype looks ugly, to avoid that we have to we have insert a image of new nice looking iPhone shell in our prototype manually & inside that we put UI Elements. 3)Not having support to see it on mobile devices with actual size: we can not show the mockup to our stakeholders on actual iPhone like a native application, every time we have to open it in browser window. I would suggest to add a full screen support on mobile devices without browser window. 4) Download as app feature missing: Many times we need to test our mockup on actual devices but there is no facility to download it as an app, I would suggest to add this feature, this feature is already present in other applications like Invision app wherein the mockup can be viewed as an app on tapping the mockup icon on mobile phones. 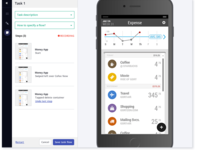 Overall: Easy to create application screens & very simple to create prototype. Pros: Indigo supports the design process much better than the competitors such as Axure and Sketch. It's very easy to learn and to use, so I use it For the thinking and sketching phase, sometimes instead of pen and paper. And on the other hand, it has very advanced features which allow me to create advanced interactive animated prototypes. 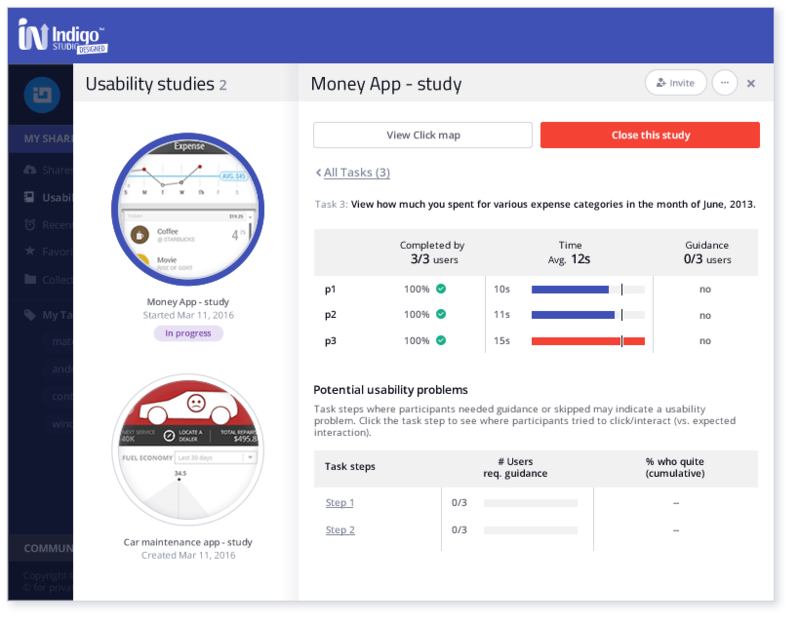 Recently they add structured ability to create usability study and I use it a lot. It seems that Indigo team work hard to improve it on a regular basis. Overall: Although Indigo has many features and abilities which allow you to create advanced and complex prototypes, the prototyping model is very flexible so you don't need to focus your attention on the tool itself. You can invest all your efforts in creating the prototype you wish to test or deliver and easily change it according to the users need. You don't need to invest your resources in planning HOW to do it. I use it to design and prototype business web applications for European Institutions. Pros: Very fast designing process including the magic ALT-click. The animation timeline that is intuitive and easy to use. Regular updates that brings new stuffs based on user requests. I really appreciate this approach that most companies don't put in practice. The Sharing functionality that is easy to use and allow us to show and collect feedback of users. Lat but not least, the user support is one of the best I had. Thanks again to these guys! Cons: It's still tricky to use it behind our company firewall. Seems to be fixed in the lasts versions but still unstable. e.g. it lost the sign in quite often. The pricing policy is quite expensive so we limit our number of licences. Pros: I love how I can easily add UI elements to the page and how it gives me a tool to tell my developers exactly how I want a page to be laid out. Also, screen parts are very useful and save me a ton of time when designing storyboards. Cons: I hate the fact that table cells aren't containers, so if I want to put a button in there, it's just an overlay that doesn't follow the table. Also, there's no really good way to several enter notes about particular UI elements. I can add callouts and notes, but that gets very unwieldy after 7 or so notes. Easy to learn and use. Has some great features that allows collaboration and usability testing. Pros: I love the fact that we can make it so realistic it looks and behaves like the real tool and allows us to test. The creation of a URL we can share with the teams and update is great too. The animations are great! Very easy for the UX team to show the Dev team what we need. Customer support is awesome!! Here is a company that really listens to users and develops features we really need and use. Cons: I would like and enhances ability to control fonts (add my own) and also control the look of scroll bars. 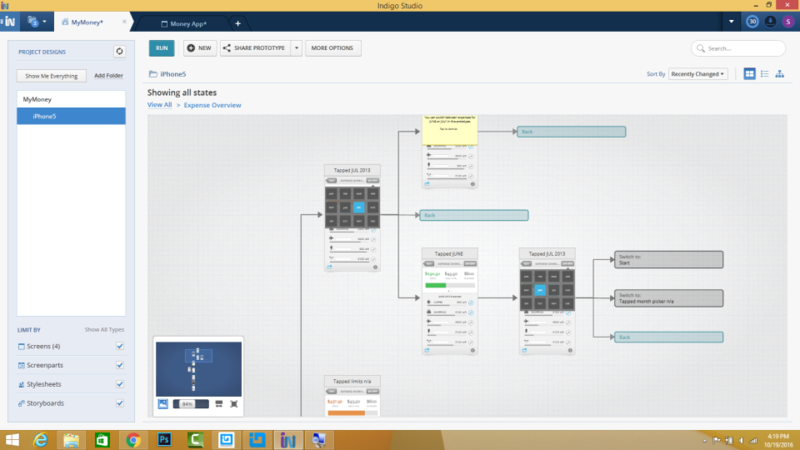 Overall, I have enjoyed using Indigo to create various prototypes and taught it to my coworkers. Pros: I really like the base version of the software because it is free and has enough features to be relevant and make a good prototype. I like how there is a free version and the chance to get an academic license because students really enjoy using the software to make prototypes and express their ideas. I enjoy the elements provided, features and the options for viewports. The prototype can be as advanced or as simple as the person wants it to be. I like the ability to save my projects directly to my personal workspace which makes it easy to work on the go. Cons: The program can be pretty confusing to use if you overlook the tutorials and video that are presented to you from Infragistics. I personally teach a course on App Design Prototype and I use Indigo to do so. I present a demonstration in the class and show the students where everything is and how things work. The students really enjoy the demo and it helps them understand the software. I think that the Indigo Essentials version should still let you share your prototypes with people via links! Is there a way to delete projects I have saved to my personal workspace? Overall: I got to use this program for one of my IT classes in which we had to develop an app prototype to solve or remedy a social program. Aside from this, I have taught the basics of this class (elements, interactions, animations, etc) to several coworkers at my job at Rutgers University. Pros: Ability to create interactive prototypes with animations quickly and also ability to sync with Sketch to reuse artifacts . Usability testing is something which starting to get used in our workflow. There isn't any prototyping tool with this kind of animation capabilities. The best for the money. 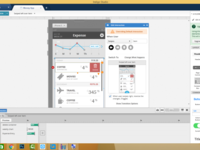 Pros: There is a lot of intuitive features for interactive prototyping, usability testing, and collaboration. You can copy/paste your designs from Sketch and animate your interactions in any possible way. Cons: Occasional bugs and slow performance on larger projects, probably because of MS Silverlight. There should be more features (like in Sketch) for high-fidelity design and typography. I still think its the best solution for the money. kind of animation capabilities, there is only Axure RP, which is expensive and way less intuitive. 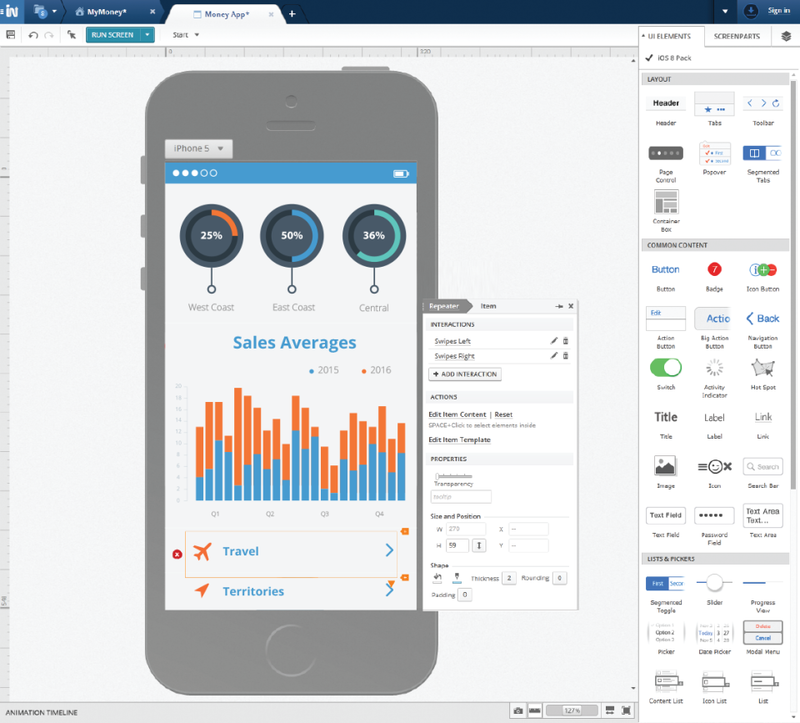 Pros: We looked at all the wireframing tool on the market, and none have the features that Indigo Studio has. The ability to be able to deploy wireframes as a site is invaluable to our proposal process. Cons: There are a few small lingering bugs, but nothing so bad as to stop us from using the product. This mostly has to do with text entered in wireframes. Pros: As a software engineer who works on legacy software with an unfriendly UI I thought "I'll bet I can come up with something better." Indigo Studio makes it easy to develop a prototype of a better way that I can present to management and our product designers. I really like that I can easily create not just static mockups, but functional prototypes. And from an engineering perspective, it's nice that there's no code involved so management can't say "It looks great. Ship it!" It really is just a prototype. Cons: I wish the included tools were a bit more customizable. For instance, backgrounds can only be one color, not a gradient. Also, the chart control only allows you to set the type of chart but nothing more about it, though that can be explained away as "it's just to show a chart goes here." Finally, it would be nice if the code snippets panel was editable to allow for even more customization. Overall: It helps me easily create attractive prototypes to present to management and our product design team. Pros: Ease of use , the kind of interactions I can showcase and most importantly secure url sharing with clients. Pros: What I like most about the software is that it saves massive amounts of time when it comes to showcasing a product because you can share your vision with others without actually having it created through extraneous amounts of coding. It's a very cost-efficient option that comes with amazing depth and variety. The interface is also very user friendly and simple to use. Indigo's quality is top notch, as it can provide prototypes that already look like finished products. It is a go to for any developer seeking to extend their unfinished vision in an illustrative way. Cons: What I like least about the software is simply that it can be sometimes difficult to understand how to locate and use everything properly. But, thankfully the tutorials and customer service easily clears up a lot of the confusion if utilized. Overall: My team and I were able to demo an idea that we needed to illustrate to a panel of judges for an IT project in my college. This software helped my team win an award in an end of the semester competition that we had with plenty of other groups. The judges enjoyed using our prototype and it helped provide an interesting outlook on how our idea would function if it were actually made into an application. So thank you to all who helped develop it, especially on behalf of my group! Pros: I like how it allows you to re-use work that you've already done, instead of having to rebuild menus that would normally be re-used throughout anyway. Cons: Often times, it's difficult to see when something has gone wrong, and fixing something that has gone wrong - Once you have a number of layers going together, on top of one another, and something isn't working the correct way, it's almost impossible to get looking the way you want it to without rebuilding the entire scene. And if something is going wrong in a bit that you're re-using across the entire app, that behavior may not be consistent throughout the build. Overall: Using this program for class made prototyping highly streamlined, and allowed us to jump directly into building something without having too much to worry about learning toolsets. Sharing files made collaboration relatively easy. Pros: Easy to use and contains a lot of functionality and elements to create and test our mockups. It also great support platform if we run into problems. Cons: I would like to see that the elements to be used in the software are more and faster up-to-date to current standards. For example there are a lot of icons, but no Google Material Design icons. Also Material design screenparts would be nice. Overall: It helps us to communicate our mockups more clearly to our target audience. Pros: Easy to get started, several pages of advice on the Internet web you get stuck. Premade components help speed up the design process. Cons: You cannot expand the pallet to the left in a transition. You cannot change the scroll bars from the default ones which are hard to use and difficult for people with accessibility issues to grasp (literally speaking). I used Indigo Design Studio for an IT project to create an app prototype for a Big Data "company". Pros: I liked how it was easy to use and the interface was very simple. It integrated common features of an iPhone and was easy to use for other people when interacting with our prototype for the first time. Indigo Design helped our prototype to appear professional and realistic and really helped our project to come to life. The ease of use with integrating outside images was also extremely helpful to our design strategies. Cons: There's no option for a cloud based sharing component of Indigo. We were working as a team so it would have been easier if two people could collaborate on the design at one time. It was a bit hard to overcome that obstacle but overall we were able to make it work. Fast and easy to learn. Indigo Studio is a tool for beginners and advanced users alike. Pros: The thing I love most about Indigo Studio is the interactive ability to click and select any type of icons/widgets/buttons without going into detailed tools selection. Some other programs that have prototype design require the designer to learn different snips of code, whereas Indigo allows anyone to just pick up the software and use it. Cons: I wish the software had more features. There is already a lot of things indigo can do, however, if I wanted more specifics, such as a dynamic flowing interface that changed different buttons and widgets based on swipe, Indigo does not have a tool for that. Indigo does have all the basics for buttons and features for different prototypes, but I feel this can grow with time. Overall: I understood how to prototype design without using any programming language. This is very important in the field of technology because not everything is about coding. Design for the user experience is a heavy part that the modern world seems to be dropping the ball on. I believe indigo will allow my ideas to grow. Pros: The collaboration aspects are good and that is important. The interface is good to use and the URL access clean and efficient. Cons: Not suitable for WinForm or WPF and this is disappointing. Also, no ability to build a tool box of re-usable controls. It is all cut/paste/edit. The other big negative is that we cannot populate drop choices. There is no way to integrate small data bound lists. The girds would be awesome were we able to use simple SQL queries to load because otherwise, it is extremely tedious to load data. It doesn't have to be interactive, just have some way for us to load the data. Pros: I like its versatility and ease of use the most. Even as a complete beginner, when I first the product, it was very accessible and provided many options that helped me polish my work to make it look professional. Pros: The interface is neat and simple tp use. It was easy for me to understand the first time i opened Indigo studio. It was pretty easy to navigate around. I was able to create my prototype in less than 5 hours. I was able to correct the design and other functionality with the help of this prototype, such as animation, Transitions and editable contents. i was able to receive feed back from my faculty members and i was able to change to UI instantly. I was able to present the entire product which was actually equal to the final product. Cons: Sometimes there is a lag while constructing huge prototype. Paid version are quite expensive wish they were a bit more cheaper. Customization of components like textbox, dropdown is not possible. Overall: -Make High fidelity wireframes quickly and present it to stakeholders. I have worked in Balsamiq and made the switch to Indigo and LOVE the enhanced features. Pros: The ability to bring Balsamiq work into Indigo is a huge plus. Also the ability to have features and animation abilities that are very easy to configure. The training videos are a GREAT! Cons: The only downside is I found it difficult to copy an element without making a screen part. Could be my lack of experience. Overall: Ease of use. Extremely ease to design and setup interactions. Testing is a breeze! this UI even though none of our co-founders have any coding experience. Quick and easy to use, intuitive and user friendly. Pros: Intuitive and has the needed features to create most common prototype challenges that me and my team are facing. In comparison to existing products out there, indigo is by far, superior. It is helping us approach users with high end prototypes, fast, accurate and with no development efforts. My design team has become powerful and independent! Plus we are all aligned and on the same page using the collaboration Indigo tools. Cons: Rendering is a bit slow maybe due to the Silverlight engine. No palette saving. No typography details. Complex prototypes get really slow and break. Not enough of collaborative design. Still, need some enhancements to compete with prototyping tools that exist in today's market. Pros: This is helpful in doing a run though with my team mates to see what we're missing. It's also helpful in getting feedback. Cons: It's is difficult to collaborate with others. There should also be additional features for the mobile stuff. I am using this to design UI for desktop and mobile. Have tested also other sw, this is the best. Pros: Lots of features, nice collection of UI elements, I especially appreciate there is a separate collection of iOS elements. Cons: Perhaps a little bit too expensive to renew. Learning how to use some more advanced features takes some time, it would be nice if there were some video tutorials (perhaps there are). Overall: Design and documentation of the user interface of my software. It is a very useful tool in the phase of preparation of software development. Pros: I've participated since the beginning of the software lifecycle (from beta phase) when it was free to use. We've been going through some preparation to start a software from scratch or add new features to an ongoing software where we can use your tool to eliminate some misunderstanding of customer needs. Cons: Silverlight as the base technology of the tool is not what we really like to install on our computers, but we can live with it, not as our partners. It is not a favorite framework and we had unsuccessful business meetings because of our prospects had security policies to not install Indigo Studio and the reason was that is not widely supported software (in browsers). Another big disadvantage of your tool is that it can't be easily implemented into other project management software's lifecycle. Pros: The speed and ease at which you can produce a rapid prototype is great. It gives you a way to share ideas and concepts without taking the time needed to code the entire project. Cons: I wish it was more tightly integrated into a production environment to help expedite the creation process as well. 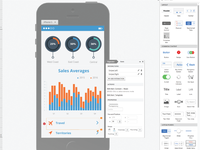 This is a powerful prototyping software. The support and community get you off the ground. Pros: I like the rather intuitive and simple manner of the layout. While many capabilities are available, the software does not press or require one to use them all unless they want to. Cons: So far, I haven't found a least liked feature. But if I had to pick one, is that as the domain expands and everyone is scrambling to follow their own standards and customizations of UX design/workflow, there is the rub - investing in proprietary software. 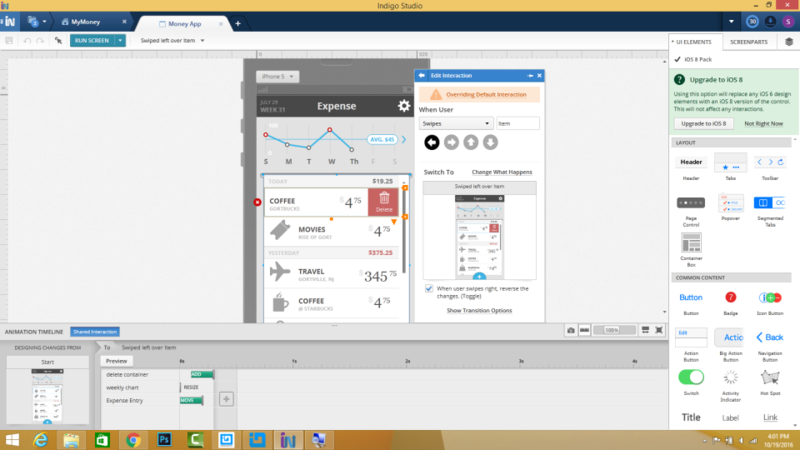 We needed a tool to produce template based prototypes and Indigo studio is that and more. Pros: Easy to use. Value for money. User expectations are managed by producing the prototype for what will be delivered. Controls used in the screens match bootstrap, etc. making it easier for developers to deliver as the prototype matches what can be produced. Cons: At first you have to start slowly and get to learn the product. I guess that is just me though, otherwise it's a great product. 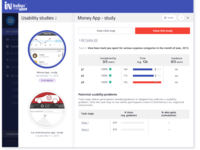 Overall: The biggest benefit was that were able to produce what the end product would look like before we had developed it and demo it to users to get feedback. Once there was agreement on what was produced we would develop it. the feedback loops were faster than ever. It was a worthwhile experience to learn something that helps segway someone into creating apps. Pros: The software generally does not have a high learning curve allowing for people to learn how to make simple applications. Of course it is nothing too advanced, but helps generate interest in people who would've thought it was impossible before. Cons: Some things were laggy depending what platform you were using. Some features of indigo were hard to use or hard to link. This was especially so if you made a mistake as some issues were unforgiving and took time to fix or recreate. Another issue was when trying to get multiple users to work on the same project. Some things weren't transferred correctly and had to be redone multiple times. Overall: Learned simple things about creating applications. Pros: i do not need too much instructions but intro was very helpful. I like that the layout is easy to understand. I enjoy figuring things out myself so this is great to work on. I also like that help is available if needed. I like variety of options and views of prototypes as well. Very easy to share work with others. Cons: none. I downloaded this to participate in a workshop and while the workshop was not great this program was easy to learn if I spent more time on it. Pros: I like that you can make quite advanced prototypes. Cons: My biggest concerne is with performance. It is painfully slow to work with and that is the main reason we abandoned it in my consultancy. Pros: It is user-friendly and sounds a great alternative for prototyping. The customer service is very good too. Cons: The loading process is not fast enough, that makes designer wait a little bit more than usual compared to other existing design tools in the market. The updating process and UI can be improved too. Overall: It is always good to be familiar with several design tools when it comes to prototyping and wireframing. I like learning it more and attending some webinars to deepen my knowledge. Pros: Very simple interface I figured it out quick and made my apps soon after learning. Very modern tools as well. I enjoyed the icons and the ability to customize past the items given (such as adding pictures). Cons: Not enough variety and some parts were tedious such as adding object and making screens connect to each other. Should be easier to connect different app screens through the use of buttons. Also was a lot of pop ups along the way. I use this software to design mockups and prototypes for my university classes. Pros: It is does not have a steep learning curve; that is, it is easy to get the hang of within a few minutes of playing around with it, especially if you have used a similar software before. Cons: Downloading the software was a tedious process, because I had to install and update several systems and program before I could even download Indigo. 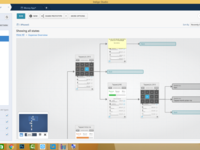 Overall: I was able to make realistic, yet simplistic working prototypes using this software. Really super for rapid prototyping! Pros: It's very intuitive and user-friendly. Also, it's great that Infragistics makes their products available for students free of charge for one year. Cons: I haven't found anything I don't like yet, though I have only used it for wireframing so I can't speak to all of the features. 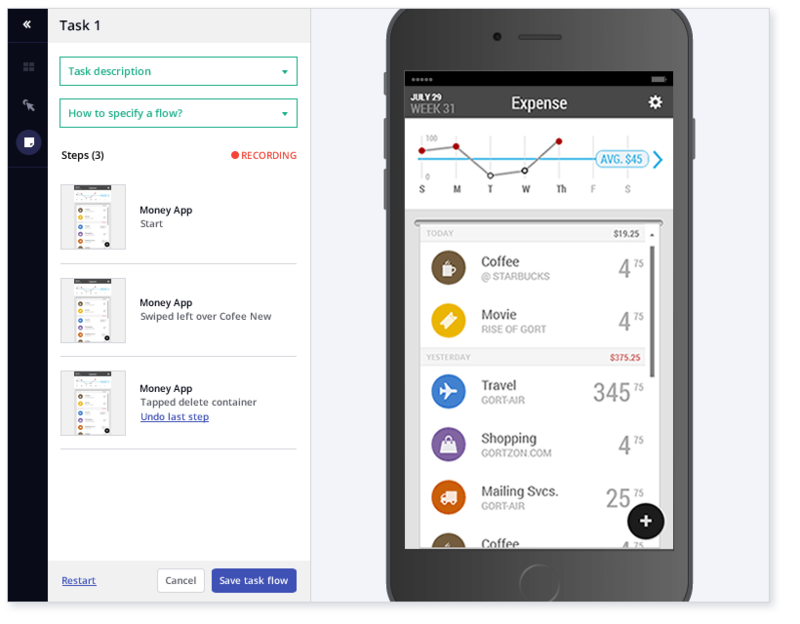 Overall: I was able to learn rapid prototyping as a student without paying for a product I couldn't afford or losing my project after a short (7-30 day) free trial. It speaks well of Infragistics that you support learning. Pros: The ability to share prototypes and get almost immediate feedback has helped me multiple times with my academic and professional work. Everything is simple and easy to understand, even to people like me who know only basic coding. Cons: When using it on Windows I cannot use copy and paste on my prototypes. Also when using responsive layouts, my images and background images disappear in screenshots. Pros: The software is easy to use and the controls are very nice and useful. The customisation options are enough for nice mock-ups. The copy paste and the duplicate options and screen parts are amazing. Cons: The controls library is basic. I miss controls like scheduling and charts and plots. Pros: The software was designed in a way that made it easy to prototype, and also easy to make fast updates. Cons: hrmmm... code generation from it is not too flexible. If I could generate code that worked with android fully, using differnetly layout designs, that would be cool. i.e. fragments. Pros: The pros of this software are that it is really good for creating applications for different projects that I can use in the future. Another thing that is really good with saving certain projects and you can make new things while working on other things too. Overall: The benefits I recieve from using this project are creating a UI/UX Design for my application that I am working on in my current management project. Another thing is it creates possibilities to create an app for my Akshon Esports project. bit lost at first but after looking around for a while I was quite happy. Overall: We are doing some designs in it and we will be using it the rest of this year because we've invested the monmey. However when extra functionality for responsive designs will not be added in future updates we will look for another product by the end of this year. With no prior UI/UX design experience, Indigo Studio was a breeze to learn. Pros: I like how everything is so easy to learn. The website is easy to navigate and the ability to run it and test is great. Cons: I feel like the website is geared towards iOS, which couldn't be a barrier for people with PC's to use. I liked my overall experience with Indigo Studio. I found it to be very easy to learn and use. Pros: What I like most about this software is the graphics and overall functionality. I found it easy to use Indigo and create designs and outlines for a potential project. Cons: What I like least about this software is when I finish creating my design, I find it a little hard to see how my design works. Meaning, it becomes a little confusing to use execute the project and seeing all the actions I have implemented in it. Pros: The part I like the most about this software is the ease of creating a prototype or proof of concept for class and my own ideas. I have used the software as a way to create a rough draft of apps that I ended up later creating. Cons: I think the actual features that can be implemented should be more fleshed out. There should be more functionality to the point where you could make fully functional simple apps.